I’m flying back to New York today after spending a week in Chicago and a couple of days at home with my parents, too. Twelve days absolutely flew by! I spent Mother’s Day with my family, got to play with my 2.5 year old niece for a few days, sent way too many snapchats of my dogs, had a week-long sleepover with my college bestie, celebrated the marriage of another friend alongside a huge group of our college pals, took a ton of SoulCycle classes at the newly opened Old Town studio, spent a day wandering around Chicago with my mom, hung out with Hallie in the city we became friends in 4 years ago, grabbed lunch in Lincoln Park with Liz, got my hair and makeup done at Goldplaited for the wedding, wandered through my old stomping grounds in Lincoln Park, explored new (to-me) restaurants in the West Loop… The list could go on and on. I had such a fabulous week in the city that I’ll always call home. The notion of home is one that’s been on my mind a lot lately. I’ll share more about this later, but I actually got ‘evicted’ from my apartment a few weeks ago… Talk about a surprise! On May 1st I was notified that I had 60 days to find a new place to live. But like I said, that’s a whole different adventure that I’ll save for another day. Chicago is one of the cities that will always be ‘home’ to me. The town I grew up in will always feel like home, my parents’ house will always be the home I grew up in, Champaign where I went to school always feels like home when I return, and New York will always be home to me in so many different ways. Paris is another city that sparks something inside of me that makes me want to call it home. I’ve been fortunate enough to visit Paris twice in the last seven months, and I get that same feeling that I used to get when I visited New York before I decided to make the move from Chicago. I’ve always been the type of person where I want to do all of the things. There are not enough hours in the day for all of the jobs that I wish I could do… There aren’t enough days in the year for me to eat at all of the places on my NYC Restaurant Bucket List… And similarly with cities, I wish I could live in Chicago, New York, and Paris all at the same time. Different parts of me become more alive when I’m in each of them, if that makes sense. I’m drawn to so many different places for a plethora of reasons and it’s hard for me to figure out where the heck I want to be! Do you ever feel the same? For the time being, however, I’m beyond excited to get back to New York and take advantage of this beautiful time of year. I’m looking forward to laying on a blanket in Central Park, wandering around Soho with an iced coffee in hand, brunching in the West Village, taking a trip over the bridge to Brooklyn, and figuring out where my next adventure will take me! PS: There are plenty of Paris posts coming over the next few weeks! Rather than posting all of my photos and recommendations all at once after a trip, sometimes it’s more fun for me to be able to re-live the memories for a few weeks (or months) after. My favorite places to stay, shop, explore, eat, and drink will be up next week! Love these pictures, Paris is such an amazing place. I totally understand when you say Chicago and New York are your home, because when you travel or live in different places for a while it can become home 🙂 OMG what happened with your apartment? Hope you will be ok! Very pretty outfit! 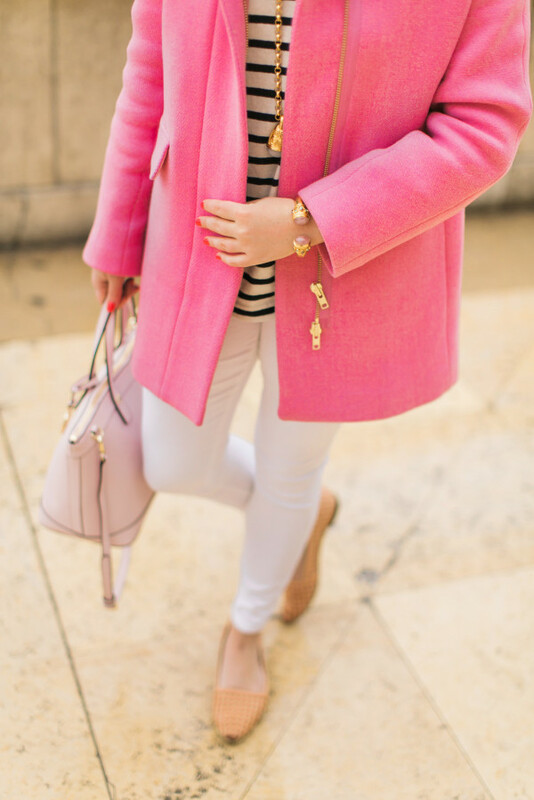 Great coat, love the color of it! That’s so nice that you feel at home in different cities. It sounds like each one has something different and special to offer. These Paris pictures are amazing, and I want this whole outfit! I don’t know if I’ll have time to see Paris on this European trip but your pictures have me dreaming of the city…. I’m so sorry to hear about your apartment, but I really enjoy your optimistic outlook about the whole situation. Good luck on your search! Gorgeous outfit! Looking forward to seeing what happens next! I can completely relate. There are certain parts of me that feel at home in different cities, but I’m just trying to enjoy where I am at the moment! These photos are just absolutely stunning. SO gorgeous! cannot wait to see even more from the trip! Beautiful jacket and beautiful photos! Love, love, love these pictures! They are perfection! I definitely can relate to feeling a draw to certain cities. Especially when you visit – you feel pulled to stay there because it sparks a connection unlike anywhere else. Such a chic look, which is great for Paris. 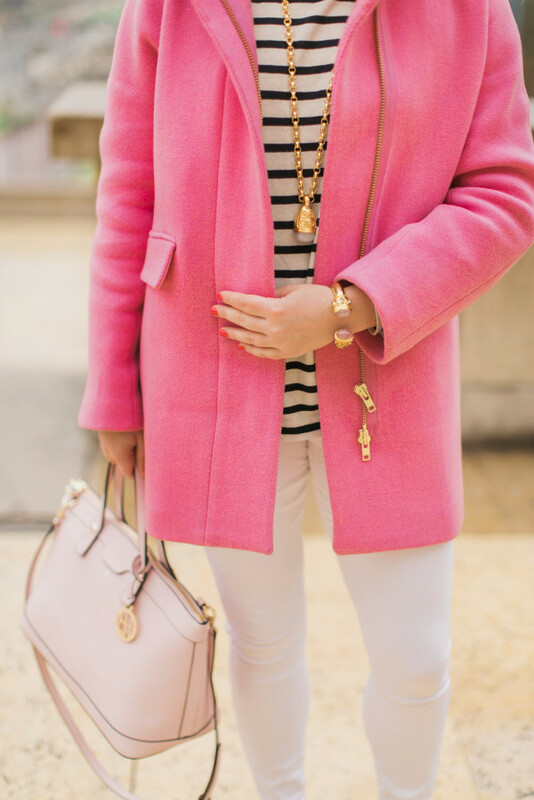 You look gorgeous in this outfit and I love how you’ve accessorised it and added a nice touch of colour with this pink coat. 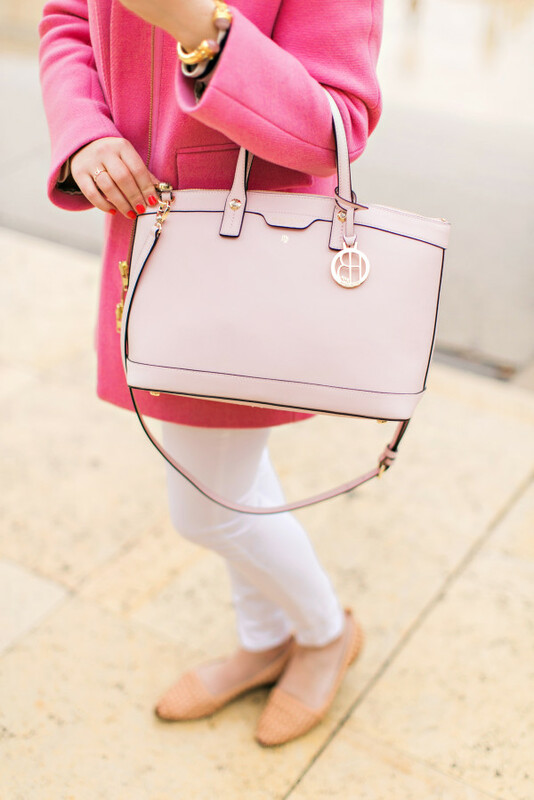 I am absolutely obsessed with pink coats – very Jackie O. I look forward to visiting Paris someday! Love this Jessica! I totally know what you mean when you say you come alive in different cities! I have never been able to describe my love for San Francisco but thats the perfect way to describe it! I feel like I really come alive when I’m there. I felt the same way when I first took a trip to Los Angeles and I have officially decided to make that my new home, super scary!!! I saw your snap chat about your apartment and hope all is going ok!!! Good luck. You look perfectly Parisian in these photos! So happy to see these pictures and I’m in LOVE with your jacket! What a fab color on you. The fact that vacations fly by SO much faster than real life, is my least favorite part about going ANYWHERE. Very pretty look! Wouldn’t it be wonderful if you could own a place in NY, Chicago, & Paris one day? I say, you should try to make it happen. I’m visiting Paris for the first time this Friday. Do you have any places to eat or drink that you could recommend? I know you said you would share in future posts, but it would be great to try some of the places you enjoyed. Thanks! Love that coat! I totally get what you mean sometimes it’s just crazy to think about everything I want to do and all the places I want to visit – my list just keeps growing for each. I get inspired at the most random things and it makes me want to explore this new idea. I just think it’s important to actually try and do it all of things you want even if some turn out bad because you never where those adventures and dreams may take you! You look gorgeous & I love your coat!! 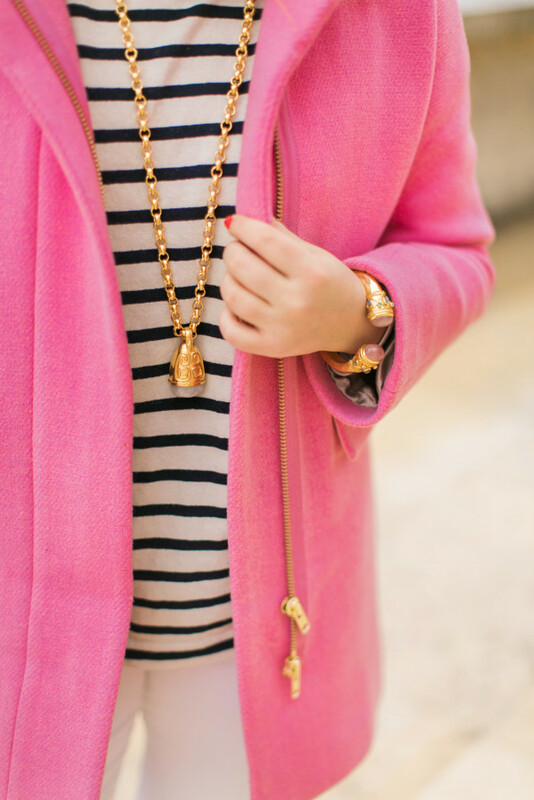 Stripes, a pink Henri Bendel satchel, and the eiffel tower? What a chic and classy combination!!! Love your style! Love everything about this post! Paris has such a magical atmosphere, I cannot wait to return. I LOVE the Montmartre arrondissement. Best of luck with the new apartment search and move!! I totally thought that you were going to write that you were moving to Paris with the way you started this post! It seems like you had a wonderful time. And I love the coat and bag! Perfect for the location. Hi Jessica! I love your Paris photos and your blog! I was super excited when you posted this because I’m traveling to Paris next Friday for the first time and would love it if you could suggest places to go, things to do and most importantly how to pack. I’ve been overwhelmed on thinking about what to pack! From your pictures I am thinking I need to pack some cold weather items? Also, I’ll be visiting Chicago in July and would love any suggestions for that too! Thanks so much!! I have never fallen in love with a city like I did Paris. Beyond beautiful!! 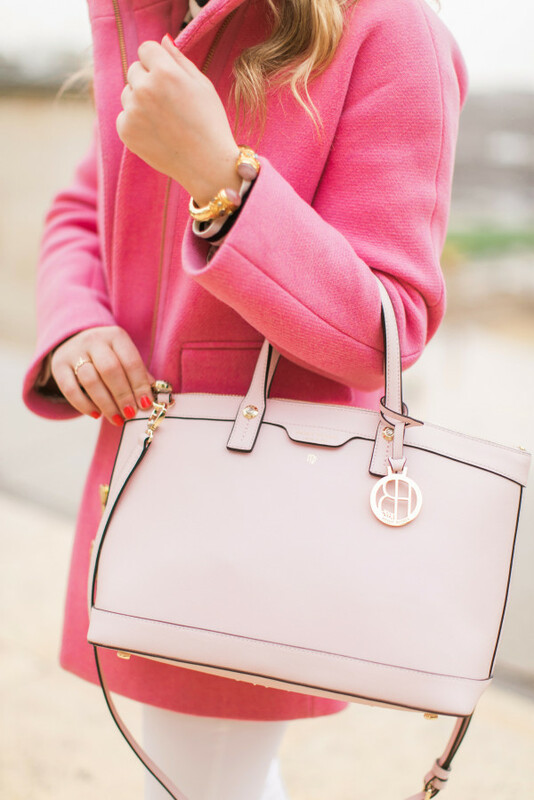 Love these photos of you- such a pretty pink coat… when did you go to Paris? I totally get what you mean about the “home” thing – different cities just jive with you in different ways! Glad to hear you loved Paris, and this outfit is AMAZING. Love the pink coat instead of the what-I-would-have-expected red coat. Sounds like you had a great time in Chicago! You’re making me feel like I need to get out and explore more!